Only when horses have to perform at a higher level do they have an increased energy requirement. Horses that have to do heavy work are eventing horses, endurance horses, trotting and race horses or horses in the high class dressage and jumping. Horses that have to deliver heavy performances will certainly benefit from concentrates. The amount of energy a horse needs to handle that load can not usually come from roughage. The character of the horse determines the temperament. Unfortunately, this character does not change. 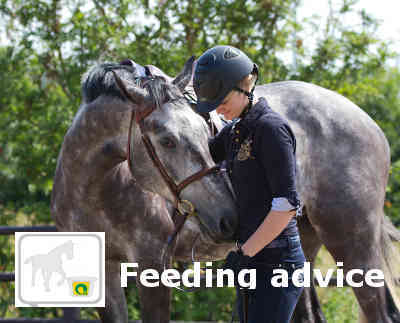 Yet there are some adjustments in the ration possible, so your horse can be less nervous and stressed. Energy that is less easily digested in combination with a high-fat diet may lead to less nervousness. In America, an investigation has been conducted in which a link has been established between the ration and the temperament of the horse. A ration with carbohydrates that can easily be digested, made horses much more restless and less manageable. When these horses get a ration with a lot of fat, they became clearly calmer. Roughage is an important factor in the ration of a hot horse. With Hartog Lucerne-mix, part of the concentrate can be replaced. Lucerne mix contains more vitamins and minerals than hay / silage, which can reduce the amount of concentrated feed. Extra Balance Structure muesli can be added for light work. If the horse has to do heavy labor, Energy Special cereal mix can be fed without oat feeding to keep your horse a little quieter. Another alternative is feeding vegetable oil (eg sunflower oil) as an energy source. A high-fat ration generally also results in less temperament. Giving sufficient exercise is also a means of losing excess energy. With your feed choice you have to take into account the character and temperament of the horse. If a horse has always been slow, it might just be slow. The character of a horse can not be changed. If a horse is less fit than usual, the balance of energy, protein, minerals and vitamins and the composition of the feed should be checked. A bit of fast energy in the form of oats or concentrates in combination with training can make the horse more lively. A concentrate feed with fast energy is the Energy Classic. A cereal mix with oats. This cereal mix contains sufficient energy for long-term performance and peak performance. In addition to the power supply, make sure that there is enough variety in the training, do not give your horse a break once in a while, and do not overestimate him.